On Day One I reported for duty along with about a hundred other people. We would work 10 hour shifts with a 30-minute meal break. We would have access to an unlimited supply of muesli (granola) bars, and I sensed that this detail was significant. If I was assigned to work at the other end of the venue (a 1/2 mile away) it could take most of the meal break to get to the cafeteria and back. “Does anyone know how to work a walkie-talkie?” asked our leader. I thrust my hand in the air before I realized that I had never even seen one up close. My id apparently knew that this question was what would separate the next two weeks into ‘exciting and fun’ and ‘watching paint dry’. My id was right. I looked at the walkie-talkie, heavy in my hand. I sneaked some glances at my fellow team leaders while they turned theirs on and made adjustments. I did the same moves, a beat behind, and within about 90 seconds realized that pretty much anyone could have raised their hands when our boss asked the question. A piece of cake. I met my team, we moved down to our part of the convention center – fencing that day – and I took them through their roles. Essentially, ‘security’ meant that we checked credentials at check points, which were posted between events and for anyone other than paying public to get into the venue. I was relieved to discover that we would not have to actually enforce ‘security’, because the only move I had was to put my keys in between my fingers so as to rake them across an assailant’s face. And, I didn’t think that this was in keeping with the Olympic spirit. Besides, there was a team of paid security guards to assist the Gold Team with securing the venue. I was disappointed, however, to see that as the days passed, fewer and fewer volunteers returned for their shifts. By the end of the 2 weeks, we were down to 1/3 of the original group. This meant longer shifts for those of us who showed up, and that many checkpoints within the venue and between events were left unattended. Late into the games, came a highlight of my volunteer experience. I met Evander Holyfield. I was back-of-house at the Boxing, and he showed up with his entourage. They all had their Olympic credentials, but he didn’t; he had left it in the hotel. I wouldn’t let him in. To be clear, it was my job to not let him in. One of his minders asked if I knew who he was. I did not. After the 30-minutes it took one of his crew to go back to the hotel and get his credentials, I knew all about him. He was being very good-natured the hold-up preventing him from seeing the boxing. Finally his minder returned with his credentials, and he shook my hand and said it was a pleasure to talk to me. When I got back to where I was staying, I looked him up. He was a much bigger deal than I had thought. I also met ‘Aussie Joe’ Bugner, the Australian boxer-turned-actor, who lost to Ali in 1975. He is a bit of a legend in Australia, so I knew who he was, and he came and hugged me at the conclusion of the boxing to thank me for my volunteer work during the games. Nice. By the end of the games, I was working an average of 14 hours a day. I rarely got time to all the way to the cafeteria so the muesli bars were my main source of sustenance. I got to use my limited French a few times, but my very limited Spanish made a Spanish official laugh out loud. Apparently, instead of, “I don’t speak Spanish,” I told him that he didn’t. As a volunteer I was given tickets to see Cathy Freeman’s victory at Olympic Stadium and to attend the Closing Ceremonies, not to mention all the bouts of boxing, wrestling, fencing, judo and weightlifting I saw. I met medalists, dignitaries, athletes and travelers from all over the world. It was brilliant. 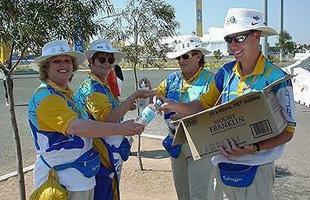 At the London Olympics my good friend, Dawn Denton, is volunteering with the South African team. You can follow her adventures here. How privileged we are. I love your blog Sandy. It always reminds me of what an amazing woman you are and what incredible things you’ve done.